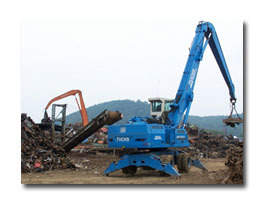 Penn Recycling, Inc. utilizes a hydraulic 800 ton guillotine shear to process large unprepared materials such as I-beams, heavy plate, pipe, farm machinery, rebar, truck frames and heavy equipment to a specified size and density for better manageability by the steel mills and foundries. Laborers remove and sort unacceptable objects from a shaker table ensuring quality control. The resulting product is a clean grade sized according to mill parameters. 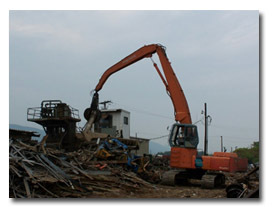 Other equipment utilized at this operation include rubber-tired hydraulic cranes, mobile shears, rubber-tired and track loaders and track-mounted hydraulic cranes. All in-bound and out-bound materials are weighed upon a 70’ certified truck scale and monitored for radioactive contamination by our state-of-the-art radiation detection systems. 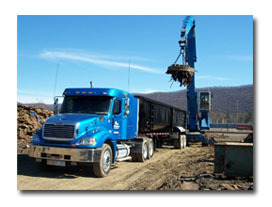 Materials that we purchase and process are delivered to steel mills and foundries throughout the East and Midwest via truck and/or rail.